Whole strawberries are dipped once in melted semi-sweet chocolate and a second time in chocolate sandwich cookie crumbs for a simple, yet elegant, dessert. 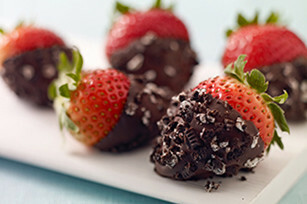 DIP strawberries in chocolate; roll in crumbs. PLACE on waxed paper-covered baking sheet; let stand until chocolate is firm. Prepare using white baking chocolate. Dipped strawberries can be stored in tightly covered container in refrigerator up to 24 hours.